Scientists and medical professionals have coined a new term – oral-systematic connection. It refers to the connection between gum disease (periodontitis) and the health of the rest of your body. The main nemesis of total wellness is the bacterium. While there are several types that are actually helpful to your body, there are still those that cause havoc. In your mouth, they are attracted to leftover food particles and use them for fuel to help them grow and multiply. Untreated, these bacteria will lead to a host of dental problems, including gum disease. Periodontitis is a disease that unfolds in increments. Over time, bacteria form into plaque – a clear sticky substance that clings to your teeth and seeps beneath the gumline. The result is that the gums become infected and inflamed, and inflammation creates the perfect environment for new diseases to develop in. The inflamed blood from the gums cycles to other parts of the body, carrying the infection and causing problems. The good news is that all of these issues can be avoided. 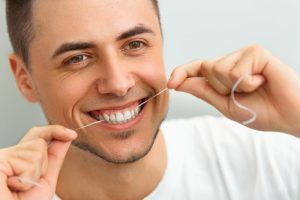 Maintaining Excellent Oral Hygiene – Keeping your gums and teeth clean is of paramount importance, because it prevents the growth of the harmful bacteria that can set off a chain reaction of events. Therefore, it’s best to brush and floss your teeth at least two times a day. Visiting Your Dentist – Equally as important as practicing oral hygiene is visiting your dentist for cleanings and checkups every six months. These appointments can save you from a world of discomfort and problems, because your dentist and staff will be able to rid your mouth of bacteria and plaque, while looking for any signs of developing issues. Eating Healthier – When you think about how often you eat per day and then over a week’s time, you can start to get a picture of how much your mouth gets bombarded by substances. Thus, it’s logical to eat healthier – which includes more fruits and vegetables – because it helps to improve the environment within your mouth. To schedule your preventive care visit, reach out to your dentist today! A graduate of the University of Texas Health Science Center San Antonio Dental School, Dr. Renee Corbitt offers comprehensive care, treating patients from one to 92. To better serve her patients, she continues to pursue more knowledge through postgraduate education courses and affiliation with several professional organizations. Dr. Corbitt can be reached for more information through her website.